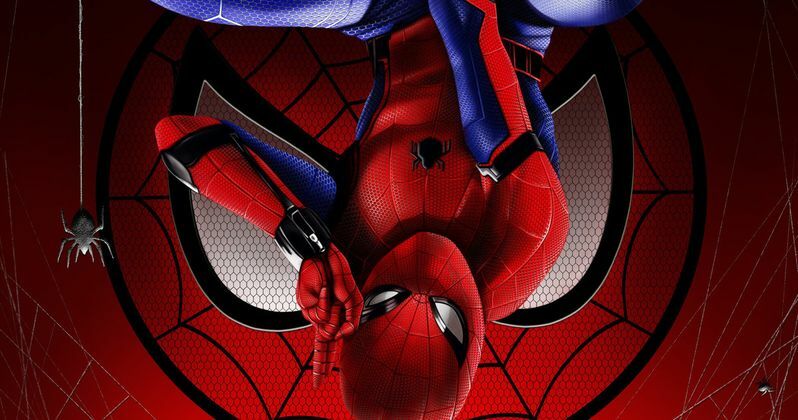 While fans wait for the latest in a series of Spider-Man: Homecoming TV spots that center on an NBA Finals party, Sony Pictures UK has debuted a preview that highlights the high-tech features on Peter Parker's (Tom Holland) new Spidey suit. As we know, Tony Stark (Robert Downey Jr.) designed and created this suit, and we've already seen plenty of its powers put on display, such as the webbed wings. But this sneak peek offers even more insight into just how cool this suit really is. We also get new interview segments with both Tom Holland and Robert Downey Jr., who are quite enamored with the functionality of this costume. This preview debuted earlier today on Sony Pictures UK YouTube, which begins with Robert Downey Jr. revealing that Tony Stark helped Peter "up his game" by designing this new suit. We also get a glimpse at a scene where Peter first hears from the A.I. assistant built into the suit, who congratulates Peter for completing the training and unlocking the suit's full potential. While this hasn't been confirmed, this A.I. is most likely Friday, voiced by Kerry Condon, who has voiced this A.I. in Avengers: Age of Ultron and in last year's Captain America: Civil War. This A.I. was created by Tony Stark before the Battle of Sokovia in Avengers: Age of Ultron, and now it seems he has given this A.I. assistant to young Peter Parker. In another brief interview segment, Tom Holland reveals that the Spidey suit is the "coolest thing" that has ever happened to him, with another scene where Friday reveals to Peter that he has 576 web shooter combinations. We've seen a few of these before, like the "web grenade," which detonates and traps the target against the wall with this explosive webbing. We also get a better look at the "reconnaissance drone," which is actually the small spider logo on the chest of his suit, which detaches and flies off to provide Peter with some surveillance. There is also an "enhanced combat mode," which is put on display during a scene where Spidey foils a bank robbery, where all the thieves are wearing Avengers masks. We also see brief snippets of scenes where Peter is activating different features like "taser web," "web wings," and even a "super jump," which he performs off of the top of the Washington Monument. One of the brand new scenes in this video showcases another new feature of the suit, "advanced reconnaissance mode," which allows Peter to hear anything anyone is saying, while maintaining a safe distance. This particular scene is quite interesting, since it features Bokeem Woodbine as Herman Schultz, a.k.a. Shocker. We reported last month that this new Spider-Man adventure was on track for a huge box office opening weekend of $135 million. While that tally would be far greater than the opening weekends for The Amazing Spider-Man ($62 million) and The Amazing Spider-Man 2 ($91.6 million), it still falls short of the franchise record of $151.1 million earned in 2007 by Spider-Man 3. Still, the buzz for Spider-Man: Homecoming is quite high, so it's certainly possible that it could exceed these early projections and set a new franchise opening weekend record. Take a look at this preview featuring the high-tech Spider-Man: Homecoming suit.